When Jacob Blank of I&J Manufacturing demonstrates his mowers at Horse Progress Days in recent years, you can just about see people's mouths water as they watch the double-blade, scissor action slice through thick hay. How nice it would be, they think, to be able to run a mower that almost never plugs and is built from all new parts. But because those mowers had always been hung on a 3-point hitch or trailered behind a forecart, either operated with a PTO or an on-board engine, most people also considered how they might miss the time they spend sitting on their McCormick -Deering #9 mowers where the blade sings just in front and to the right of the driver. There is something sublime about watching the grass fall away as the sickle cuts a swath. When the mower runs behind a forecart, the driver has to turn and look behind to see the work being done. A number of teamsters who cut hay didn't want to choose between the modern mower blade or a self-contained ground-drive mower. They convinced Jake to develop a modern equivalent to the McCormick #9 mower. The first model was built last November and Jake hopes to have five or six working on the first cutting this spring and early summer as I&J tests the equipment before launching full production later in the year. The mower operates without a pitman stick, but instead has a series of belts that provide a safety release if an obstacle is encountered. To eliminate the need for hydraulics, I&J installed a lever to lift the bar above mowed grass. One of those planning to test the mower is Dris Abraham of Historic Prophetstown in Battle Ground, Ind **(Dris has moved to Oklahome since printing of this article). Dris has been using Jakes mowers behind I&J's heavy duty ground-drive PTO forecarts for several years and has become a strong advocate of their mower technology. The first model was built last November (2010) and Jake hopes to have five or six working on the first cutting this spring and early summer as I&J tests the equipment before launching full production later in the year. The mower operates without a pitman stick, but instead has a series of belts that provide a safety release if an obstacle is encountered. 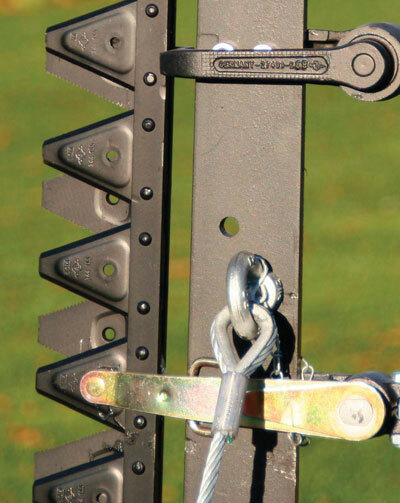 To eliminate the need for hydraulics, I&J installed a lever to lift the bar above mowed grass. One of those planning to test the mower is Dris Abraham of Historic Prophetstown in Battle Ground, Ind. Dris has been using Jakes mowers behind I&J's heavy duty ground-drive PTO forecarts for several years and has become a strong advocate of their mower technology. The mower will also be demonstrated at Horse Progress Days in Clare, Mich., June 29-30, 2011. 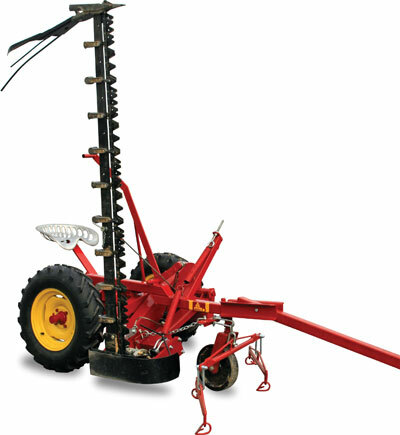 Designed to be pulled by a team of two horses or a single horse, the mower comes equipped with either a 5-1⁄2- or 7-foot bar. In the case of a single horse, Jake said he plans to fit the machine with a pair of shafts and singletree. For more information and pricing I&J, call 717-442-9451 or click to go to their website. Judging from the activity the topic recently generated on the Rural Heritagewebsite's Front Porch forum, there will be a lot of interest in this mower when it is fully released for sale. This article appeared in the April/May 2012 issue of Rural Heritage magazine.